The bureaucrats at the FDA, bless their pointed little heads, claimed in a Consumer Advisory Bulletin back in 2009 that colloidal silver “may” interfere with the absorption of prescription drugs like penicillamine, quinolone, tetracycline as well as thyroxine medications. This claim has stuck, being repeated incessantly across the internet by well-known websites such as WebMD.com, MayoClinic.com, RxList.com, the National Institutes of Health website and numerous others. Back in October I wrote to you about my adventures in trying to get the FDA to document their claim that colloidal silver “may” interfere with the absorption of certain prescription drugs. You might remember that I pointed out the claim has been repeated ad nauseum all over the internet, and is being used by certain well-known colloidal silver detractors to frighten people away from trying colloidal silver. I also explained that I’d hired a researcher from the pharmaceutical industry to comb through the online PubMed database records to see if he could find any clinical studies that backed up the FDA claim. He found none. I then conducted my own research, and could find no corroborating evidence for the idea that colloidal silver can interfere with the absorption of prescription drugs and medications. Could you please respond with the documentation for this statement? I've searched the PubMed database and cannot at this point find any clinical studies documenting the details in this statement. I’d very much appreciate it if you could send me the documentation. In other words, they told me to go pound sand. Obviously, if I wanted the information, I was going to have to work for it. I assume the bureaucrats figured I wouldn’t go through the trouble of filing an official Freedom of Information Act (FOIA) request. We will respond as soon as possible and may charge you a fee for processing your request. If your informational needs change, and you no longer need the requested records, please contact us to cancel your request, as charges may be incurred once processing of your request has begun. For more information on processing fees, please see http://www.fda.gov/RegulatoryInformation/FOI/FOIAFees/default.htm. Ah…now we’re getting somewhere, I thought. At least they’re acknowledging my FOIA request. And they even appeared to understand my question. Progress! But then October ended and November rolled around. And December. And finally, I figured I wasn’t going to hear from them at all. Until December 6th, when I received a plain white envelope in the mail from the Department of Health & Human Services, the FDA’s parent organization. 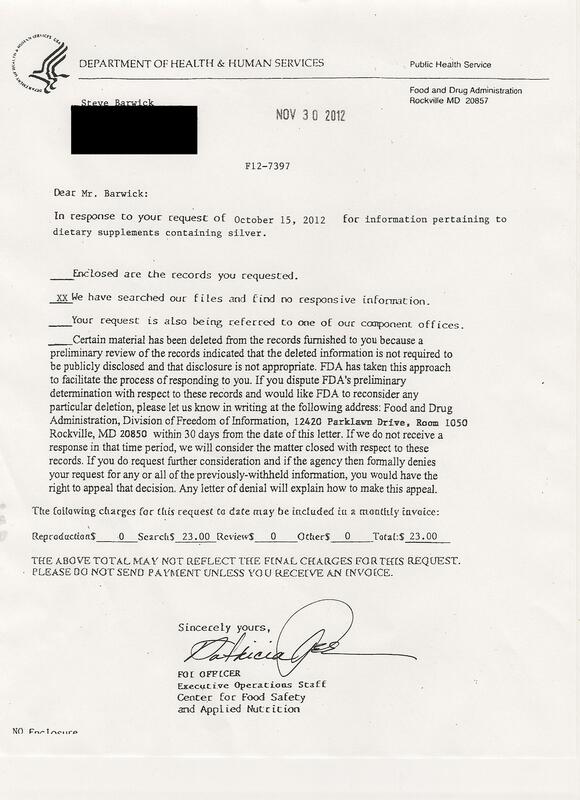 In response to your request of October 15, 2012 for information pertaining to dietary supplements containing silver. Yep. The FDA is going to charge me $23 to tell me they have no documentation for their own claims. What a great country, huh? I can only wonder what the charge would have been had they actually found evidence for their own claims! You’d think they’d be too embarrassed to charge money for having to admit they’ve just been making stuff up out of thin air. But no. Bureaucrats have no shame. Of course, this kind of thing should come as no surprise, especially in regards to colloidal silver. After all, there are numerous myths being perpetrated about colloidal silver, as I’ve described in my previous article, 8 Prevalent Myths and Misconceptions About Colloidal Silver. I guess I can add one more myth to the pile, which is to say, the myth that when the government makes a claim about colloidal silver, they actually have documentation to back up their claim. Of course, I’m not a doctor. I’m a natural health journalist. So if you’re concerned about this topic, do be sure to run this article by your doctor and get his advice. After all, I’d be remiss if I failed to point out that just because the FDA has no documentation for their claim, doesn’t mean the claim isn’t true. In spite of the profound lack of evidence, there nevertheless might well be people who have trouble processing certain prescription medications. And maybe colloidal silver usage could make it worse, in some rare cases. As we’ve seen, at present there’s apparently ZERO clinical evidence for this. But that doesn’t mean it can never happen. After all, it wasn’t too long back that doctors figured out that eating grapefruit before taking certain medications could in some rare instances prevent the body from properly excreting those medications, and therefore cause those medications to build up to unhealthy levels in a small subset of people. So if you choose to use colloidal silver, and you take prescription medications of any kind, you’re still responsible for working with your doctor to make sure your medication is working correctly, and your supplementation with colloidal silver (or any other nutritional supplement, for that matter) is not interfering with it. This of course can easily be done through simple blood tests that would determine if blood levels of the drug are too high or too low, or if the desired effect of the drug is taking place, i.e., for example, tests to determine whether or not your thyroid medication is keeping your thyroid hormone at the proper levels. Obviously, if your doctor is concerned about your colloidal silver usage due to certain medications you’re taking, you can talk to your doctor about mitigating the possibility of interaction between your colloidal silver supplement and the absorption of your medications by taking the colloidal silver at least several hours after taking the medications, or even at opposite ends of the day. That way, as I mentioned in my previous article on this topic, your medications are already fully absorbed by the body before colloidal silver is introduced into the body. Or, you may want to err on the side of caution by foregoing the use of colloidal silver altogether. Hash it out with your doctor, and insist he provide evidence for his concerns, if he has any. Meanwhile, if you’re interested in learning more about the powerful, infection-fighting qualities of colloidal silver, just click the link for additional in-depth information you won’t find anywhere else.